Column by Punta Gorda Airport CEO James W. Parish, P.E. CHARLOTTE SUN (July 23, 2018) – Record- breaking passenger numbers. New air service destinations. Streamlined roadway connections to U.S. 17. People are talking about Punta Gorda Airport (PGD), what it means to us now and what i t means for our community’s future. PGD’s mission is simple: serving the community and business through aviation. We’re home to 400 general aviation aircraft, flight schools and dozens of aviation and non-aviation businesses. 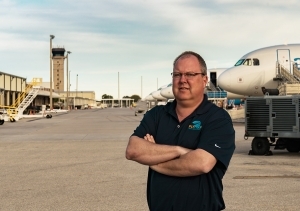 PGD is run by a 85-person staff and governed by the Charlotte County Airport Authority — a non-taxing entity overseen by five elected officials. At the core of our growing commercial success is PGD’s low cost airport model — which we pioneered under the leadership of Gary Quill several years ago. Some argue the strategy of charging airlines a fraction of traditional airports is not prudent, however, it’s a trend now being emulated by other small airports. The model has proven attractive to Allegiant while creating an economic engine with multiplier effects many skeptics don’t realize. In 2015 we entered into a 10-year agreement with Allegiant based on a turn fee for each landing and takeoff, which started at $65 per turn and will annually increase to reach $81.18 per turn in 2024. The turn fee includes Allegiant’s use of PGD’s terminal, gates, ticket counters and fueling hookup services. In addition to turn fees that totaled about $295,000 in 2017, PGD earned $60,000 in fuel profits from Allegiant’s ground vehicles, and received $72,000 from Allegiant in office and hangar rental space last year. While Allegiant purchases its own jet fuel, the airline invested $478,000 in fuel farm infrastructure that will forever be owned by PGD, and which we will continue to earn residual income from. Rental car fees, largely dependent on Allegiant passengers, totaled $3.6 million last year, along with another $2.7 million in parking fees and airline-related concessions. Allegiant also has a significant payroll here — with a local workforce of 210 crew members, pilots, mechanics and staff stationed at PGD, along with approximately 100 more employees contracted through Worldwide Flight Services to handle baggage and ground operations. Dozens of other subcontractors rely on passenger activity, from TSA screening to the food concessions inside the terminal. PGD also received more than $3.7 million in grant funds as part of the Federal Aviation Administration’s Airport Improvement Program in 2017 — a funding level we’ve only reached because of PGD’s status as a small-hub commercial airport. Our capital improvement projects are funded by these federal grants generated by user fees on airline tickets and aviation fuel, as well as state grants and PGD revenues. It’s clear that Allegiant’s investments and economic benefits go well beyond the turn fees paid to PGD. There are hundreds of us that have a direct stake in Allegiant’s success, thousands more related jobs and millions in tourism expenditures. However, it’s my responsibility as CEO to be prepared for anything; to spend wisely, to save extensively and to sustain a safe and efficient aviation hub for the region. Our low-cost airport model translates to lower fares for you, but it means you won’t see passenger boarding bridges or a two-story terminal in the near future. You’ll continue to see incremental improvements to our runways, roads and facilities according to our Master Plan and projected growth. A new general aviation facility, restaurant with a runway view, and community room will be planned as well. We’re proud of our strong balance sheet with minimal debt, 28 percent average return per passenger, and more than $9 million in cash reserves. It means we can hedge economic uncertainties and take advantage of the right opportunities — all at no cost to our Charlotte County taxpayers. PGD’s total economic impact to the southwest Florida region is estimated at more than $350 million. Your support of Allegiant, and awareness of PGD’s low-cost airport model, will help us sustain our positive economic impact, maintain and improve general aviation facilities, and attract new business development and air service options. Please visit www.flypgd.com and follow the Punta Gorda Airport on Facebook and Twitter.